To many school kids, Jupiter is the king planet, at least in our solar system. It was the center of attention for its gigantic size and in the past it was thought that no other planet could be bigger. Some people even thought of Jupiter as a habitable planet. It’s no longer the case today. Jupiter is almost entirely made of hydrogen. You can never live on it. The remaining 15% of the planet is made up of helium and other gases. What is strange about Jupiter is that phosphine, water vapor, and ammonia, can condense in its surface. And when they do, it results in a very volatile climate. There is water on Jupiter but no one knows for certain how stable it is over there. When space mission Galileo hovered over Jupiter’s clouds in 1995, it was known that water on the plant wasn’t much. Jupiter’s surface is swept by storms and strong winds. These go on for a longer period. 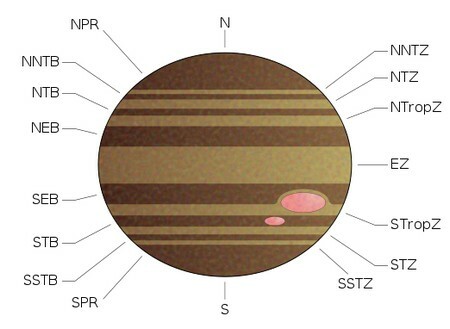 In fact storms are so much a part of the planet’s atmosphere that they have become a surface feature: the most visible storm system is the Great Red Spot. Experts say the GRS is a massive cloud formation. The GRS has twisted arms that go in every direction, with a stable atmosphere underneath. From the deep atmosphere wet air rises to a thin section in the center of the GRS. From here the “arms” swirl and reach out to the top of the clouds. You can well imagine a gigantic sprinkler. This reminds you of a hurricane back on planet Earth, but the one in Jupiter is certainly hundreds of times more massive. The first layer of clouds is made of ammonia crystals that have frozen over. They look like circus clouds at fist, but they are actually made of much smaller particles than our own clouds back on Earth. Above these clouds you have a very thick fog. This layer is believed to be made up of hydrocarbon droplets. You can see the same wrapping around the moons of Saturn. When you look down below the layer of think ammonia clouds, you’ll see another layer. Though not quite certain what this is, experts believe this layer is made up of hydrogen sulphide clouds. If not, there’s an added padding of water-filled clouds. Scientists from Oxford University have studied these layers and have proposed that the outermost layer is almost entirely made up of molecular hydrogen, liquid rock, and liquid metallic hydrogen. This is so because metallic hydrogen thrives even at very high pressure. Jupiter has 16 satellites in all. Each is as big as 6 miles or 10 kilometers in diameter. Jupiter has smaller satellites, too. Meanwhile, Io hosts active volcanoes full of gases and sulfur. Io’s surface is mainly made up of sulfur. Europa, the smallest satellite at 1, 945 miles (3, 130 kilometers), has a fine and icy surface. Jupiter’s largest satellite is Ganymede (3, 273 miles). It is bigger than Mercury. Callisto (2, 986 miles) is a bit smaller than Mercury. Ganymede and Callisto are made up of rocky substances and ice. They are also full of big craters. An ongoing space mission to Jupiter is expected to bring back more revealing discoveries.